Paula and I spent the last two weekends teaching at two lovely stores in California. 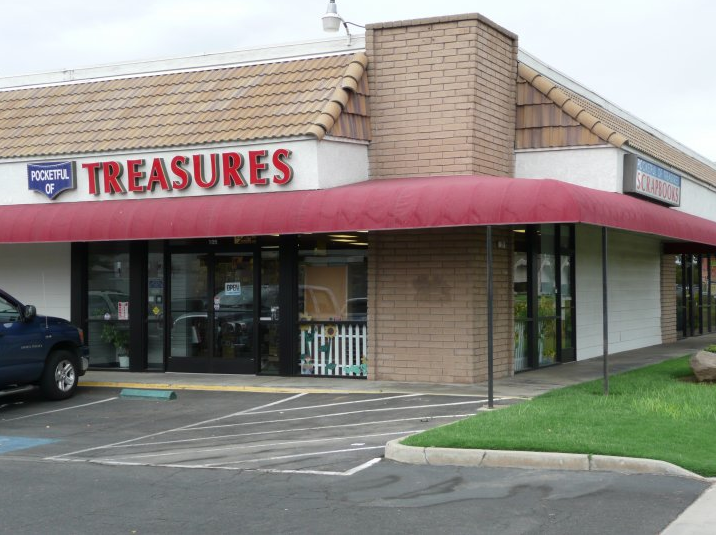 We started at Pocketful of Treasures in Clovis. We have taught there multiple times now so it's like old home week when we visit. 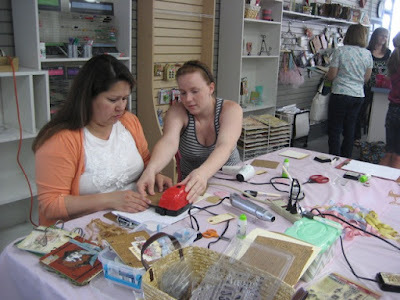 Before we teach classes on Saturday we often do a make and take Friday evening. This time we made this cute little journal showing how easy it is to use the new 7gypsies tissue paper in covering a journal. During the make and take, while everyone was busy making their journals, I noticed that several ladies were saving not only their own tissue scraps but were also getting any other off cuts that others were willing to share. I had to take this picture of one of their piles. 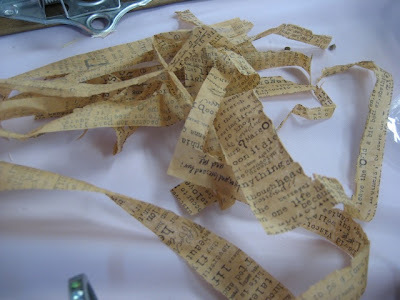 They were saving the bits for future collage projects....this ended up being a smart thing, since everyone loved the tissue and it quickly sold out. Janis and Megan are the shop owners of Pocket Full of Treasures and overseers of this fun group...we love to come and see these ladies that have become our good friends. This was our first time to visit this gem of a store. We met Patti last year at Ranger University, her and Diana opened their store almost a year ago. If you haven't been there yet, you are missing out! We thought we wouldn't know anyone at these classes since it was our first time there. 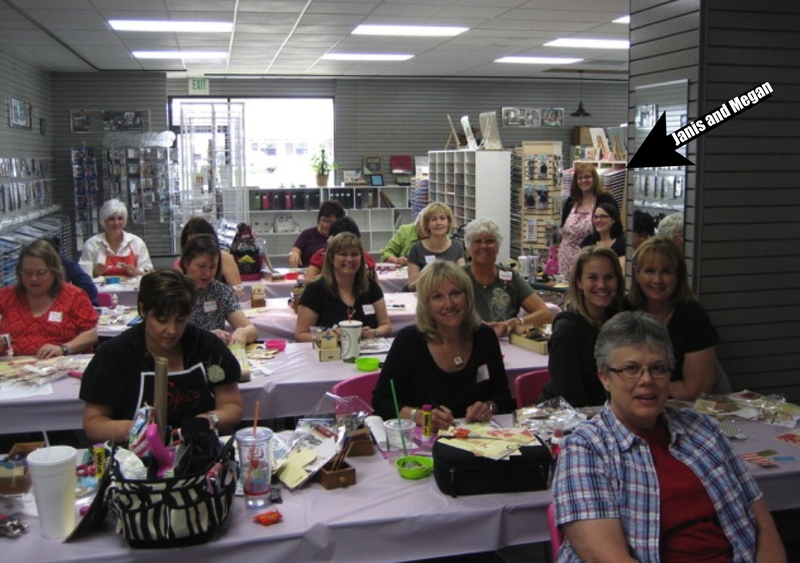 But we were surprised to see Danielle who came to my house for the "Junk Advent Calendar" class last fall AND....meet Connie and her sisters who are long time blog friends. Some of you might remember Connie's Christmas tree decorated with the tags from the "Junk Advent Calendar" kit. Amazing....check it out here. Thanks to all for your hospitality and always making us feel welcome. 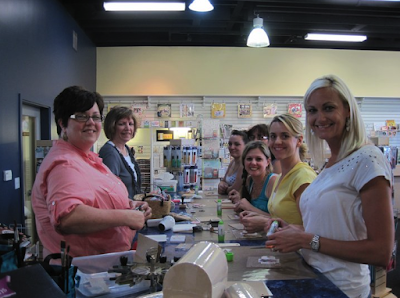 We met many wonderful ladies and had a great time while completing our projects. We hope to make a return trip sometime soon! Oh, and after we were done, we had this....we deserved it, don't ya think! 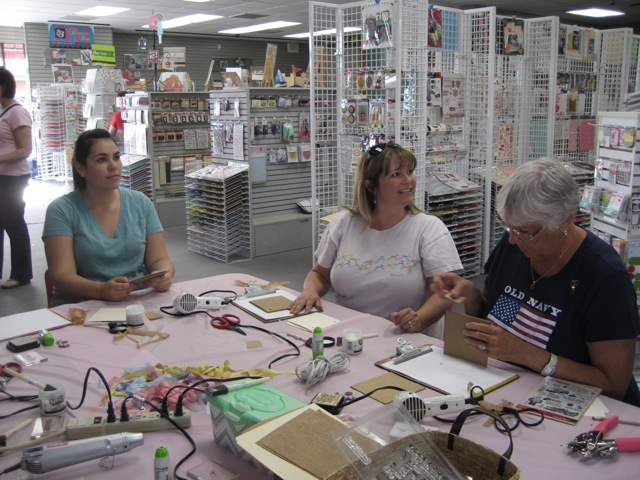 Deb & Paula, you put on awesome classes! It was so much fun to meet you both and learn some of your cool techniques. I love both projects and appreciate all the supplies you provided, the time spent prepping for the class, your organization and creativity. You two are the dynamic duo! Can't wait to see you again. Looks like fun classes. Hoping that we get to meet you soon at Whim So Doodle in St Pete!I won't stop bugging you til you come visit! Looks like lots of fun..especially that dessert! Glad you had a good time! Some day we're going to have to get the Gypsy girls to come to the northeast! I had the best time in your classes at Art Inspired Studios, the projects are amazing! I can't wait for you guys to come back soon!